Caribbean Stud Poker is one of the first RTG's games featuring progressive jackpot payout. 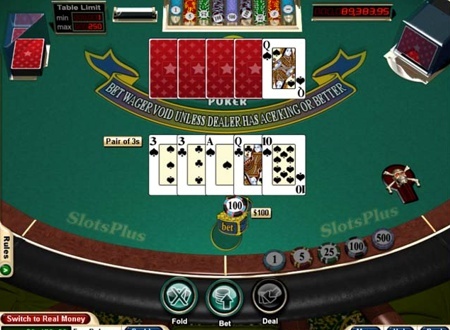 RealTime Gaming's Caribbean Stud is a variation of 5-card stud poker. The goal is to get a higher-ranked poker hand than the dealer. The dealer must first qualify with an Ace and a King or a pair or better. If the dealer's hand does not qualify, you win even money on the ante and keep your raised bet. First choose your chip size and place your bets. Remember, if you want to make a Bonus Bet (and qualify for a jackpot) you must make it before the cards are dealt. You and the dealer are dealt 5 cards each, with the dealer's last card being dealt face up. If you've placed a Bonus Bet, you'll automatically be paid out against it at this point. Next you can choose whether to Fold or Raise with the hand you've got. If you choose to Raise, your raise double your original bet and your hand will be compared to the Dealer's. A Bonus Bet costs a fixed $1 and must be made before the cards are dealt. For an additional side bet you are eligible to win the progressive jackpot in Caribbean Stud Poker game. With a small side bet needed, it makes sense to place the side bet every time you play. The highest possible win amount is the jackpot itself, which is won if you manage to get a Royal Flush. But there's one, final, important rule: in order for your raised bet to be taken into account the Dealer's hand must qualify. In order to qualify, the Dealer must hold at least an Ace and a King or a pair or better. If the dealer does qualify you'll win even money on the ante, and get paid a fixed odds amount on the raise. As a general rule, you should always raise with a pair or higher. Generally you should fold anything less than an Ace and a King High Card. As Caribbean Stud is a game based around poker hands, it's important to familiarise yourself with the hands and their rankings on the game's payout table.